procurement function in strategic procurement. 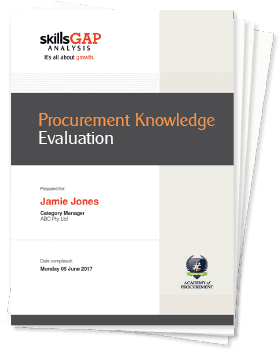 This is an evaluation of your Procurement knowledge. You will be guided through eight dimensions of Procurement and you will be asked a set of multiple choice questions for each. This is a timed assessment and at the allocated time the assessment will close. The question set is based on technical skills standards and there are varying levels of difficulty in the question set however, they are not designed to ‘trip up’ or trick you but rather to provide an insight into your expertise across procurement. 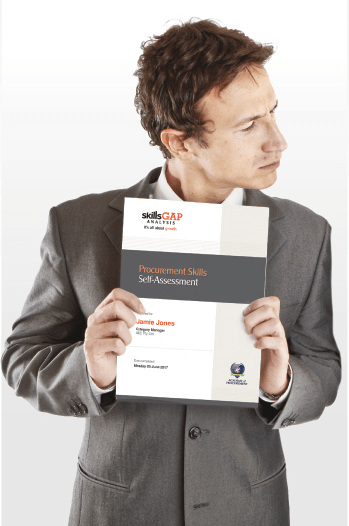 On completion you will receive an individual report with an assessment of your capability across a range of technical competencies. This report is tailored especially for you – it will highlight each assessed dimension focussing on both your strengths and your development opportunities. The key output is a set of recommendations for both you and your manager to consider in order to optimise function and individual performance. The evaluation generally takes around 60 minutes to complete. You will be taken to an Instructions page, then a general information page where we will ask a few questions about you and your procurement function. Then the evaluation begins! 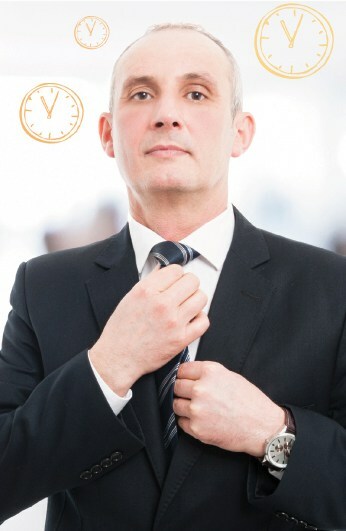 From the starting point until the end you will note a clock at the top of the page that keeps time as you progress through the evaluation.